Cheryl Morgan talks to China Miéville at China’s home in North London. 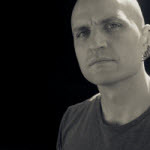 China Miéville is a writer who lives and works in London. His latest novels are The City and The City [Purchase] and Kraken [Purchase]. That portmanteau word from Fritz Leiber is Megapolisomancy. (I wasn’t shouting it at the screen. I live in a built-up area and didn’t want to be arrested.) Great interview! Murray: Thank you. I knew someone out there would know.